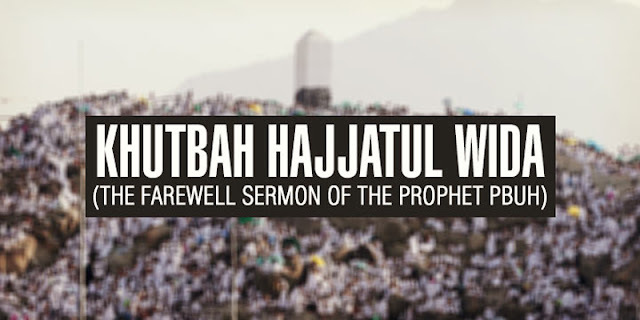 Prophet Muhammad delivered the farewell sermon during the Hajj of the year 632 C.E. at Arafah in the 9th day of Dhul Hijjah. O People, just as you regard this month, this day, this city as Sacred, so regard the life and property of every Muslim as a sacred trust. Return the goods entrusted to you to their rightful owners. Hurt no one so that no one may hurt you. Remember that you will indeed meet your Lord, and that He will indeed reckon your deeds. God has forbidden you to take usury (interest), therefore all interest obligation shall henceforth be waived. Your capital, however, is yours to keep. O People, it is true that you have certain rights with regard to your women, but they also have rights over you. Remember that you have taken them as your wives only under a trust from God and with His permission. If they abide by your right then to them belongs the right to be fed and clothed in kindness. Do treat your women well and be kind to them for they are your partners and committed helpers. And it is your right that they do not make friends with any one of whom you do not approve, as well as never to be unchaste. All mankind is from Adam and Eve. An Arab has no superiority over a non-Arab, nor does a non-Arab have any superiority over an Arab; a white has no superiority over a black, nor does a black have any superiority over a white; [none have superiority over another] except by piety and good action. O People, no prophet or apostle will come after me, and no new faith will be born. Reason well, therefore, O people, and understand words which I convey to you. I leave behind me two things, the Quran and my example, the Sunnah, and if you follow these you will never go astray.